So... It's only by 9 months since I wrote for this blog. We are re-energized around here. A fine wine to be enjoyed, a nice meal, maybe actually taking time to write what I thought of the wine - now there's a thought!!! Tonight, we had the Butternut Squash/Coconut Milk soup, garnished with crab meat and chunks of avocado. You can see more about that at the Wine Expressions Facebook Account. A pairing accident, this is what we had opened for appetizers with our neighbors (Hi Fred and Fran) last night and a touch left over (I know, left over wine, but that's a discussion for another post). So anyway... WHAT A PERFECT PAIRING! The Melville is nicely medium-bodied, just smoothly and creamily rolling across the tongue - almost matched the soup with precision. This wine is fruity, almost showing a hint of sweetness, which plays against cream and salty crab perfectly. It makes me think of a nice bit (but not overdone) dose of malo fermentation with just a little vanilla, no butterscotch, and no oak. Nice, Nice, Nice. We'll be looking for to make this available in the future. Santa Margherita nearing $25/btl ??? Why is Wine on my mind at 11:15 a.m. you ask? A) Why Not? B) because I had to go to the grocery store for other purposes this a.m. As I walked by the wine aisle, this huge display jumped out at me, declaring some sale prices. Here's the big news: Santa Margherita Pinot Grigio is now regularly priced at $24.99. I know many of you like it, and I have drunk my share. I quit drinking it however, when it topped $14 a bottle, because my opinion was it had crossed the value/price threshold. W.E. sold many cases of very tasty Pinot Grigio for less than half this price over the last few years. If you like Pinot Grigio, consider exploring the Pinot Gris labeled wines as well. Some easy sluething will help you find some very interesting wines at great prices. 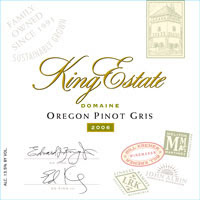 See my prior post on King Estates Pinot Gris. That's only around $20/bottle and explodes with flavor. Try also Kim Crawford Pinot Gris ( http://www.kimcrawfordwines.co.nz/popup_2007_nz_pg.html ) also found for $20/btl or less locally. I think you'll find it was worth your time to check these out and see how great this grape can be - by any name. Lately, I've refocused on white wines - which many of my friends wouldn't even consider to be wine, given it's not red! But, my insides react better to whites, so this is a bit of a push to allow me to seek out a new area and learn to appreciate it more. Speaking of which, the next case purchase in the Mitchell household will be Pinot Gris from King Estates. Ellen, Ev and I visited King Estates ( http://www.kingestate.com/ ) this past summer, and have, alas, finished all of the whites we brought home with us. We found this Pinot Gris to have incredible flavor, work well with or without food, and fit into the budget. If you get a chance to spend time in Oregon, put King Estate on your list of "must-see" spots, and make sure to stay for dinner overlooking the vineyard. I live west of Chicago in the suburbs. I always have about 10 irons in the fire. For the last 6 years, I've had the fortune to be one of the partners and educators for Wine Expressions in Lisle, Illinois. The group has become locally and regionally known for our high quality of wine education presented as part of our ongoing tasting promotions and selecting the most unique, high quality, and value oriented wines from amongst the deluge of wine selections imported into Chicago. I also keep busy during the weekdays with my IT consulting clients and schedule in as much family time as possible.